For the spaghetti chartists, this is an epic time, as the Buffleheads have blown the trends with a stunning mass influx, ahead of weather events shaping up as the northern hemisphere enters into its first rocky spell of an El Nino winter. One of the more predictable outcomes in North America is the flooding now prominent in Texas. Reminds me of Stevie Ray Vaughn’s version of “ It’s flooding time in Texas, all of the telephone lines are down.” A record 15 inches ( nearly 40 cm ) fell in 24 hours in one location. The first major Pacific upper level storm has just crossed the island giving us heavy rains through today, and a first feel of winter, as the first pulse of Buffleheads subsides. The first snow of the season occurred today on the Kicking Horse and Rogers passes. As this system passes through the prairies, it will draw down arctic air in its wake, bringing freeze-up before the end of the week. Its when this undulation reaches the American Midwest and Northeast that the weather can turn nasty as it did in 1940 with the Armistice Day Blizzard. It gave us the ballad of the Edmund Fitzgerald and the witches of November. So far the weather pattern on the prairies has not played out as it did during the autumn of 1940 when unseasonably warm weather continued throughout the west into early November, leading up to the Great Bufflehead Crash. 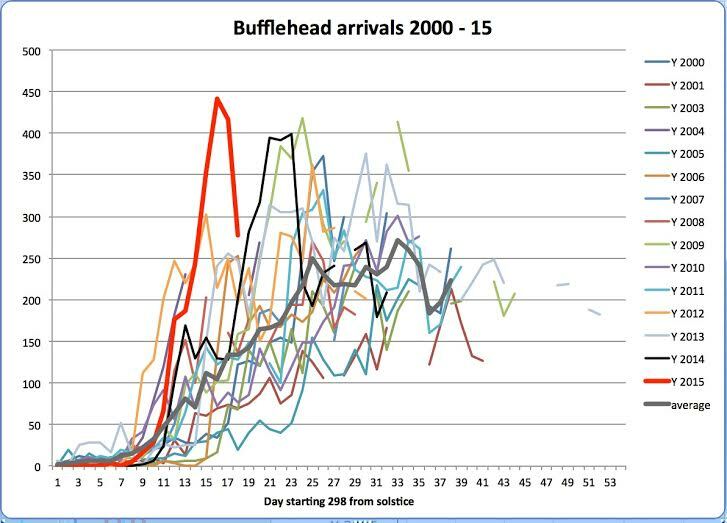 As for this unprecedented rapid early spike in Bufflehead numbers, I’m at a loss to explain. It does not seem to be purely the hand of Jack Frost at work, since there have been no sharp frosts in the interior. Evidently they’re sensitive to something else in the offing.